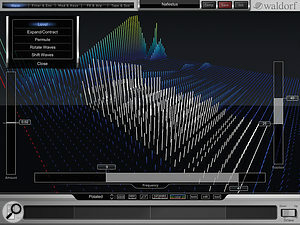 Nave's 3D Wavetable Display.Waldorf's Nave is an unusual synth, not least because of its stunning graphic interface, astounding range of features and innovative options. But where it really breaks new ground is in the way it allows users to conceive and manipulate sound. 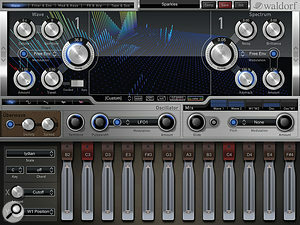 It combines wavetable and speech synthesis with traditional subtractive techniques, offering two wavetable oscillators and one analogue-style oscillator, two ring modulators, three envelopes, two LFOs, a modulation matrix, X-Y pads, a four-track recorder and some high-quality effects. 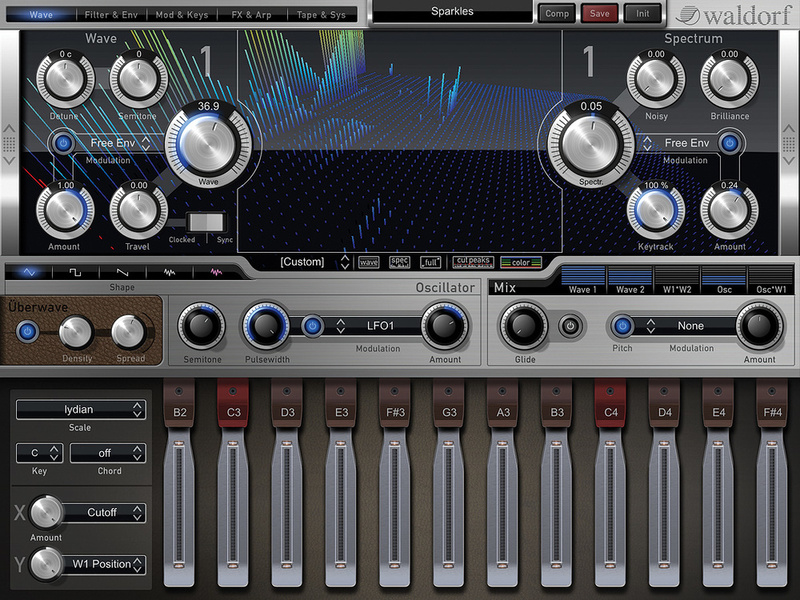 The 3D Wavetable Display and its editing controls set Nave apart from other wavetable synths. In full-screen mode the display can be zoomed and rotated with finger gestures. A clever ribbon band allows you to audibly scroll through the wavetable with and without effects to locate the desired sound. An Edit mode enables further modification of the wavetable spectrum, including the ability to change levels, rotate and shift partials and permute (rearrange the spectrum) in selected frequency areas. This allows for subtle to dramatic changes to the source wavetable and is a lot of fun to play with. You can export your wavetable to your iTunes folder to share or reuse. There are a number of interesting ways in which Nave can give life to static wavetables. Each note can play a different wave, the LFO or mod wheel can modulate the position of the wavetable and, finally, a unique Travel control allows you to cycle through all the waves of the current wavetable, clocked to a user-definable speed, Nave's built-in tempo, or MIDI Clock via another iOS app or external DAW. Additionally, the analogue oscillator's more traditional waveforms can be layered with the wavetables. Nave's Waves view with the unusual 'Blades' keyboard. There are 86 wavetables in Nave. Hardware enthusiasts will be happy to know it contains all the wavetables from Waldorf's Microwave, Wave and Blofeld synths, and there are two ways to add to these. 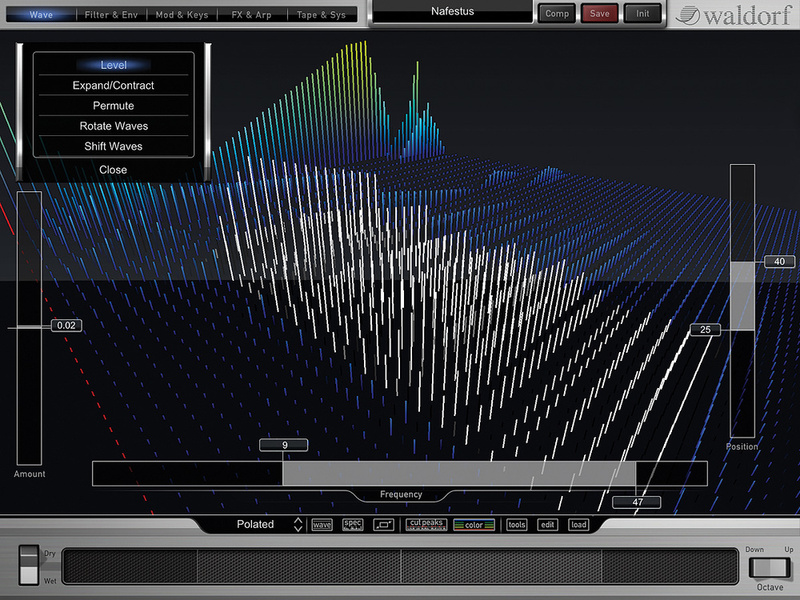 The first is with the 'Talk' function, accessible via the Tools Menu within the 3D Wavetable Display. Selecting this brings up the iPad keyboard, allowing you to type a phrase, and the text is then converted into a wavetable ready for manipulation. The second method is to use Audio Copy to paste in a WAV file from another iOS app or from iTunes. This is an excellent way to borrow favourite sounds from other synth apps and manipulate them in ways previously unavailable. Nave's keyboard size is adjustable and offers scrolling and glissando as well as velocity control depending on where the key is tapped. In addition to a scales and chords facility, a unique 'Blade' mode allows the keys to control additional parameters on the X-Y axis, making for even greater expressive performance. Core MIDI, WIST, Audiobus, MIDI learn, MIDI device manager and background audio are all supported. Latency is acceptable when controlling Nave with its internal keyboard or via another iOS app or iPad MIDI controller. It's slightly less satisfying over Wi-Fi and switching between screens was sluggish at times. Nave's feature set is almost overwhelming — exceeding that of many desktop synths — but users will have an enjoyable experience exploring the many options available. It's very easy to create good sounds quickly. Pocket Audio Tools' Tempo Finder Utility. Available for iPhone and iPod Touch, Pocket Audio Tools is essentially a simple set of four automated musical conversion tables set out in a very easy-to-use way. Tempo Finder, for example, can work out the exact tempo given a duration and the number of beats occurring during that time period. Not rocket science, but still better than having to grab a calculator and a stopwatch. And if you work with video and use SMPTE on a regular basis, the SMPTE Timecode Calculator is useful to for adding and subtracting SMPTE timecodes and frames to work out offsets and the like. All the standard SMPTE frame rates can be entered including 29.97 and 30 drop frame. The Metric Modulation Calculator is of most use to those who understand music theory, as it helps out with time-signature and tempo changes. You input the current tempo and note value as well as the relationship (expressed as ratios) between the current note value and the value you need after the time signature change. (Note value choices are selected via drop-down menus.) 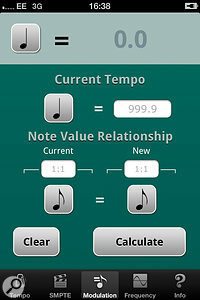 Hitting Calculate then works out the new tempo for use with your chosen note values and ratios. Finally, the Note To Frequency Conversion is essentially a scroll-down look-up table in which you can see the MIDI Note, musical pitch and frequency of a note on each line. The frequency values are updated if you change your A440Hz reference and a little speaker icon at the end of each line plays the selected pitch, which is useful for ear training or even for finding EQ settings. The notes are shown as a chromatic scale by default, but you can choose to filter them according to 16 different common scale types. Grain Science's effects page. Note the 'Shapeinator' at the top right. Grain Science utilises granular synthesis to create a sound that's distinctly different from what you might expect from instruments based on subtractive, additive or sampled synthesis. It works by taking a waveform or sample and breaking it down into very small pieces called grains, and then putting them back together in various ways to make new sounds. The app comes with a number of useful waveforms pre-installed, such as sawtooth, triangle and square waves, but the real fun begins when you record your own samples. This can be done by using your device's built-in mic, or by importing them via Audio Paste (which allows you to paste a sound you've recorded via another iOS app using Audio Copy), iTunes file sharing or Dropbox. Grain Science employs two sound sources called Grain Units, comprised of either a waveform or sample. Each offers control of speed, octave, tuning and size of the individual grains. These Grain Units can then be blended together in a number of interesting ways. Besides being able to simply mix one with the other with a crossfade, you can multiply them or use the second unit to apply amplitude or pulse-width modulation to the first. The outputs of these Grain Units pass through a standard ADSR envelope and finally a Spatialisation Panel, which offers reverb control and positioning in the stereo space (the Grain Units are mono). The app interface is structured around a series of control panels that you can swipe through. 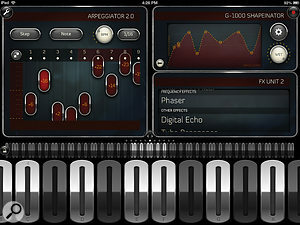 Four effects panels are provided, offering a range of echo, filter and modulation effects as well as the 'Shapeinator'. This last is a waveshaper that allows you to manipulate the input and output levels of the grains by drawing by hand — the resulting effects can be pretty extreme. Also featured is an arpeggiator, the innovative design of which allows for full screen manipulation of up to 32 steps, with control over pitch, velocity, bpm, note length and two controls which can be mapped to affect almost any parameter. Performance is via a piano-style or ribbon keyboard, or Virtual or Core MIDI. The ribbon keyboard implements velocity control, depending on where you tap vertically. A Connection Map allows virtually all grain controls and effects to be modified via velocity, arpeggiator control, MIDI or one of two unique Performance Panels, each offering both X-Y pad and wheel controllers. Very exciting real-time modification can be achieved with these. 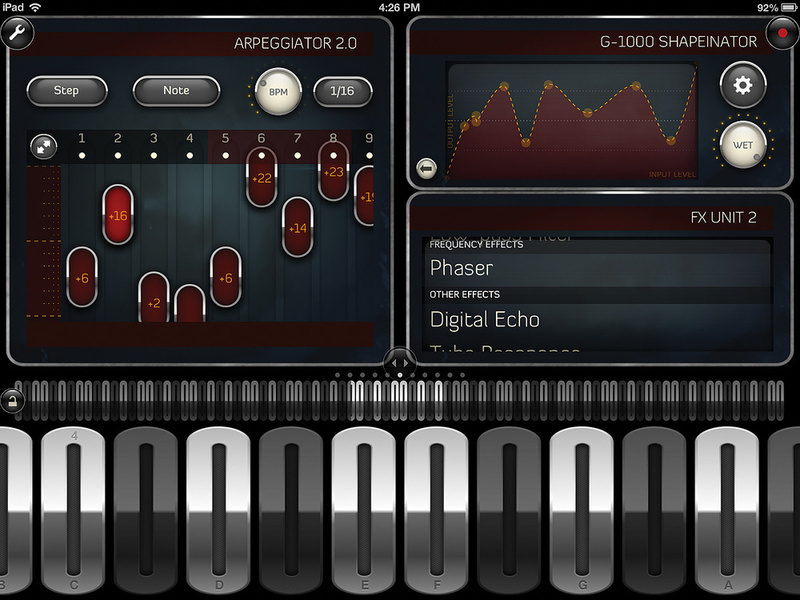 Audiobus support adds the ability to extend the effects processing using external apps. If you're interested in sharing your granular creations, users can share patches via email, Dropbox and Twitter.